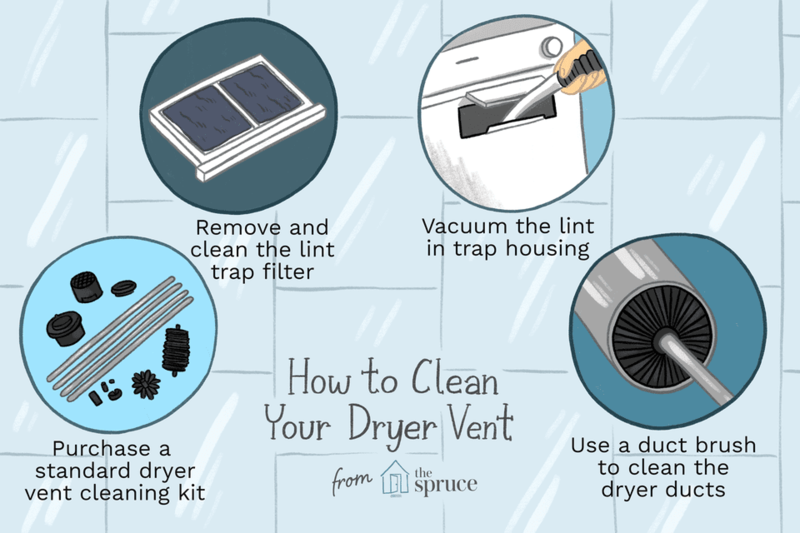 Why Clean Your Dryer Vent Duct? The U.S. Fire Administration reports that every year more than 2,900 home fires are started by clothes dryers, and the leading cause of these fires is a buildup of lint due to lack of simple maintenance on the part of the owner. Each load of laundry that passes through your washing machine and makes its way to your clothes dryer contains lint—mostly small particles of cloth and fiber that are loosened from clothing by the action of agitating water. If you think that the removable lint filter in your dryer catches all this, think again. Plenty of lint makes it past the filter and gets trapped in crevices deep inside the lint filter trap and all along the dryer vent hose or duct as it makes its way to the outside vent opening. When the collections build up, they restrict airflow and lead to overheating, which can ignite the lint itself. Brush kits come with a long-bristle brush to clean the lint filter area, as well as a round-bristled brush that can clean out a 4-inch round rigid dryer duct—the kind you should have for all concealed portions of your duct run. The round brush tip fastens to a flexible fiberglass shaft that can be lengthened in sections. Note: If you have a flexible plastic or metal foil ductwork connecting your dryer to the outside vent, this is now forbidden by most building codes. These vent tubes are used because of the ease with which they can be routed through difficult spaces, but because their insides are ribbed, they can easily catch lint and cause fires. If you have one of these flexible ducts installed, it is best to replace it with smooth-walled metal ductwork. If you can't remove and replace it, the ductwork should be regularly removed and carefully cleaned out from one end to the other. Remove and clean the lint trap filter. This is the same thing you should do before or after each dryer load to keep as much lint out of the venting system as possible. But surprisingly, many people do not do this. 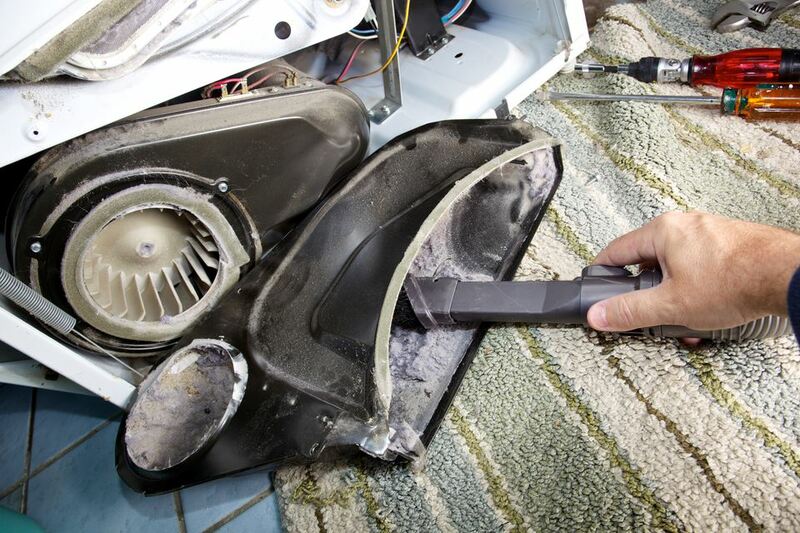 Cleaning the lint trap with each load is the best way to prevent lint buildup on a regular basis. Vacuum the inside of the lint trap housing, using a long, skinny hose attachment. Follow the initial vacuuming with a second pass, using the long flexible brush from the brush kit. Extend the brush all the way into the bottom of the cavity. With a gentle and slight twisting motion, pull out the brush to extract clumps of lint. Clean the brush bristles with the vacuum. Repeat as needed until there is no more lint that can be removed from the cavity. Unplug the dryer's power cord, and turn off the gas valve at the dryer (for gas dryers). Disconnect the duct joint closest to the dryer, then gently pull the dryer away from the wall. Disconnect the remaining exposed sections of dryer duct. If the sections are taped, remove and discard the tape. Attach the round-duct brush head to the flexible fiberglass shaft, following the brush kit manufacturer's directions. Insert the brush into each duct section and sweep it clean by using a rotating motion while moving the brush back and forth. Pull out the brush and clean the head frequently. Clean the remainder of the duct run using the same techniques, adding more sections of the flexible shaft as needed to reach the end of the rigid duct. Repeat until no more lint comes out of the duct. Check the vent cap at the exterior end of the duct to make sure it is clean and its flapper door works properly. Note: Some brush kits can be connected to a portable drill to spin the brush inside the duct. If you use this option, run the drill at slow speed and advance the brush gradually through the duct. If you don't have a dryer vent brush kit, you can use a long-handled scrub brush to clean short sections of rigid duct. Although the brush has a limited reach, you can clean each duct section by going through both ends. It's best to use an adjustable, rigid, 90-degree elbow at the exhaust end of the dryer. Flexible duct can kink when the dryer is pushed back into place, causing a major obstruction to exhaust flow. A section of flexible metal transition duct is acceptable between the dryer elbow and the rigid duct in the wall provided the transition duct is UL-listed for this use and is permitted under the local building code. ​Do not use unlisted metal transition duct or any foil or vinyl flexible duct. Attach all rigid metal and semi-rigid ductwork sections with a 4-inch worm-drive stainless steel duct band clamp, tightening the clamp with a screwdriver. All concealed ducting (hidden inside walls, floors, etc.) must be round, rigid metal duct. Replace any flexible duct that isn't exposed with rigid metal duct. Seal permanent duct sections with UL-listed metal foil duct tape. Do not use regular plastic duct tape, which dries out and fails over time. Once the ductwork is in good shape, turn on the gas valve (for gas dryers) and plug in the dryer. Push the dryer back into its normal position, making sure it's not kinking or deforming any of the ductwork. Make sure the lint screen is in place. Run the dryer and confirm that it is venting completely.